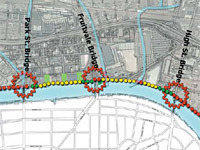 This project will connect the Bay Trail around the bridges at Park Street, Fruitvale Avenue, and High Street. A fixed pier design running under the bridges will offer an excellent waterside user experience, avoidance of auto conflicts, and acceptable construction and maintenance costs. This project will close three key gaps in the Bay Trail. At High Street, an agreement to construct a trail boardwalk has been made with Alameda County, the owner of the bridge. Design work is underway. For the other bridges, preliminary planning and negotiations with U.S. Army Corps of Engineers and Coast Guard are underway. Development. Measure DD bonds: $10 million.